This recipe uses a wet starter mix similar to sourdough – called a ‘biga’ – which helps boost the flavour and final texture. 1. Prepare the biga and rosemary oil the night before. In a deep bowl, mix the flour and yeast with 150ml warm water. Scrape down the sides, cover and leave at room temperature for at least 8 hours, or ideally 12-16 hours. Mix the rosemary and oil; cover and set aside. 2. 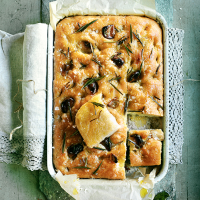 The next day, gradually incorporate the flour, salt and yeast into the biga with 225ml warm water and all but 2 tbsp of the rosemary oil and leaves until you have a smooth and sticky dough. Transfer to a well-oiled work surface and knead vigorously for 20 seconds, then rest for 10 minutes; repeat twice, using more oil as needed. Put the dough in a large oiled bowl, cover and leave to prove at room temperature for 1-2 hours, until doubled in size. 3. Preheat the oven to 200˚C, gas mark 6. Put the garlic bulb on a sheet of foil and drizzle with the oil; wrap and seal tightly. Roast for 25-30 minutes, until tender. Once cool enough to handle, squeeze out the flesh and set aside; discard the skin. 4. Lightly grease a deep 20cm x 30cm baking tin with oil. Scoop in the dough and stretch it out so it mostly fills the tin. Press the roasted garlic into the dough, then indent all over with oiled fingers. Cover with oiled cling film and prove for 45-55 minutes, until doubled in size. 5. Put a deep, metal baking dish on the bottom of the oven. When ready to bake, sprinkle the dough with flaky salt and set the tin on the middle shelf; fill the bottom dish with just-boiled water. Bake for about 30 minutes, until golden (if it’s browning too quickly, reduce the oven to 180˚C, gas mark 4). Remove the bread from the tin, transfer to a wire rack, cover with a clean, damp tea towel and cool completely. Rub with the reserved 2 tbsp rosemary oil and leaves before serving.